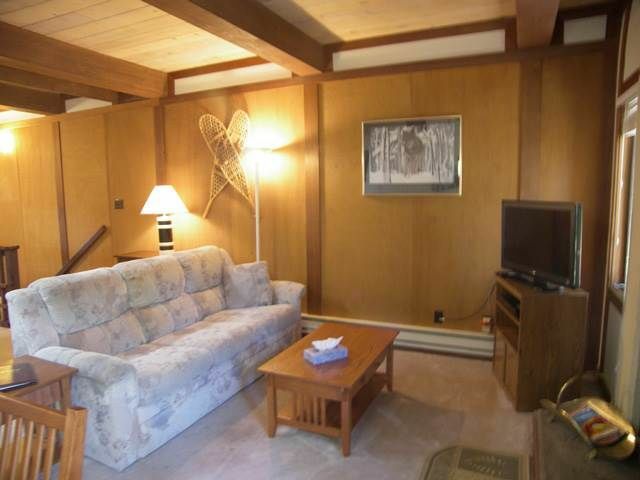 the family room is newly remodeled with a 50"HDTV and wet bar, sleep sofa and patio. This rental is very basic. Close to Diamond Peak, Raleys, good location. Tv’s in all the rooms had every channel which was nice for the kids. This place is in a severe need of an upgrade. Nothing has been upgraded since built, I’m guessing sometime in the 70s. Furniture is outdated & very uncomfortable. Masters bedroom has uncomfortable queen size bed. When we rent a place for a week, we expect some pretty basic necessities- garbage bags, dishwasher detergent, laundry soap... if you expect garbage to be taken out and all dishes to be clean upon departure, these basic items should be provided & are expected when you pay thousands of dollars to rent for a week. Will most likely rent someplace else in the future.also advertises as no pets but it’s obvious pets are there- there was dog food in cabinet and dog urine on snow on the balcony.